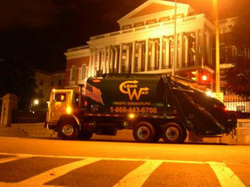 About - Clean Way Waste Services, Inc. Founded in 2004, the owners and employees of Clean Way Waste Services, Inc. have decades of waste disposal and recycling knowledge and expertise. Local company, locally owned and operated - We are based in the Boston area and have been since 2004, there is no board of directors for us to answer to. We focus on providing the best service as we possibly can to our customers, at a price that won't break the bank. Built from the ground up, we know what it takes to get the job done, and done right! Clean Way Waste provides their customers with a full range of options for the disposal and recycling of solid waste materials. We ensure that our services are performed as efficiently, effectively, economically, and environmentally friendly as possible. We believe that during these environmentally conscious times we live in when everyone is trying to be GREEN, why not be both GREEN and CLEAN with Clean Way Waste!